We are having a party in Sausalito in honor of Mom for Mother’s Day. May is mom’s month. Please join us. for you and all of your favorite women. 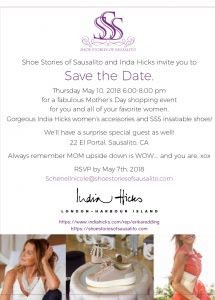 Gorgeous India Hicks women’s accessories and SSS insatiable shoes! We’ll have a surprise guest as well! There are currently no comments for Mother Day’s Party on Thursday.